Southern Dunes located in the “Heart of Florida” is just off of US HWY 27 in Haines City, approx. 30 to 45 minutes from all the major Disney Parks, Universal Studios, and near attractions such as Legoland, Bok Tower Gardens, and Fantasy of Flight. We are an established gated community with most of the homes having golf course views. There are tennis courts, community swimming pools, and a children’s play area all within walking distance of our homes. We have 24 hour security at the gatehouse making us a safe and secure place for our residents. 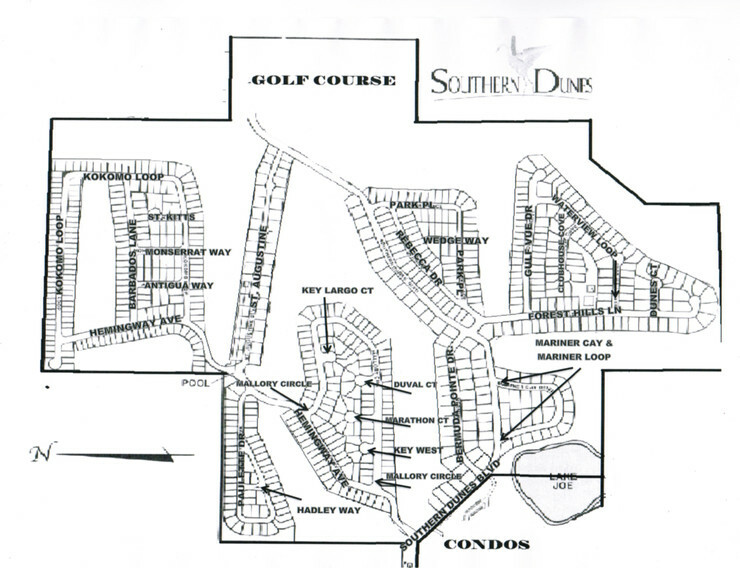 The Southern Dunes community was built by Park Square Homes starting in 1993 with the Bermuda Pointe sub division and our last homes were completed in 2005 with the Mariner Cay sub division. We now have a total of 802 homes. Southern Dunes shares it's community with the Golf and Country Club which has it’s own clubhouse with restaurant and bar on the property.